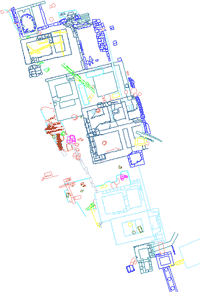 Figure 1: Restored plan of the West Forum temples in Corinth, A.D. 150. The actual physical development of the West Terrace sanctuaries began with the extension of the terrace itself and a new retaining wall in the first two decades of the colony's existence. The terrace was approximately 1.8m above the Forum floor at this time. The first sacred building on the terrace was Temple F, dedicated to Caesar's patroness, Venus Victrix. Built early in the reign of Augustus, it was a small, ornate tetrastyle Ionic temple with a niche for a cult statue in the back of the cella. It also had a large flight of steps on which may have been an altar; its three-stepped crepidoma gave it added height, so that from the Forum floor, it gave the appearance of a typical Roman podium temple. Temple D came slightly later, following the extension of the Northwest Stoa into the north end of the West Terrace. It was of the Tuscan order, with a tetrastyle prostyle porch and a simple cella; it was not a true Tuscan temple in that it lacked the tripartite cella of Italic temples. In the waning years of the Augustan principate, Cn. Babbius Philinus, a young Aedile on his way up the cursus honorum, donated a Fountain of Poseidon to the city; details are sketchy, but we know it was the third building due to its central, equidistant location between Temples F and D. Some marble dolphins, as well as the dedicatory inscription, are still extant, as well as newly-attributed structural fragments which indicate the fountain was originally covered, at least until the earthquake of A.D. 77 required the demolition of the superstructure. Not long after the fountain was built, the great sanctuary to the west known today as Temple E was built; it must have been at this time that the retaining wall between Temple F and the Poseidon fountain was torn down and the ground graded for a sloping, monumental approach to Temple E. In addition, a large 4x4m base for a statue or an altar was placed equidistant between the fountain and Temple F, and on axis with Temple E's entrance. At the beginning of the reign of Tiberius, a new temple appeared which disturbed the harmonious balance previously established: Temple G. Larger than Temple F, Temple G was a tetrastyle prostyle psuedo-dipteral structure, possibly of the Corinthian order; it also was reached from the Forum floor by a large flight of steps, although no evidence of them remains. Originally constructed of poros, it later underwent a restoration either in the reign of Claudius, or more likely, late in the reign of Nero. Its association with imperial cults of Roma and the Senate, the Emperor and his Providence, and perhaps The Public Well-being, seem fairly certain from numismatic and epigraphic evidence. Later in the reign of Tiberius, Cn. Babbius Philinus again graced the terrace with a new construction, this one a monopteral temple without cella of the Corinthian order. Its high quality, proportions, and 'tab a in slot b'-type markings lead to speculation that it was manufactured in Athens and shipped for assembly to Corinth; its architectural affinity to the recently-built tholos of Roma et Augustus on the Athenian Acropolis, and its proportional affinity to the Erechtheion, also on the Athenian Acropolis, give weight to these speculations. Figure 2: Actual state of the West Forum Terrace. To create a more magnificent setting for his new donation, Babbius also raised the level of the terrace (to 2.3- 2.4m above the forum floor) and enclosed it with a fairly ornate marble retaining wall and pavement. He inscribed his name and titles on both wall and aedicula. Soon after the terrace level was raised, a large, circular statue base was installed just on the southwest corner of Temple D.
The last structure which may be attributed to the first half of the first century is Temple K. We can determine its chronological place in the development of the West Terrace by virtue of the fact that it does not face east onto the broad expanse of the forum, but sits behind the Babbius aedicula and faces south. Little is left that can be attributed to it, so any reconstruction would be pure speculation. These buildings must all have been seen by Pausanias when he visited Corinth ca. 155, but he chose only to describe those items which were not thoroughly Roman or Romanized. Analysis allows us to determine that Temple D is the one he describes as that of Tyche, while the large circular statue base to the temple's southwest carried the large Parian-marble statue (presumably of Tyche) that he mentioned. Temple K or the Babbius monopteros are the only temples which, following D, might have had a temenos large enough to enclose a number of statues and thus constitute Pausanias' 'Pantheon'; however, since both were on the same line of site to Pausanias when he stood in the Forum and looked at that section of the terrace, and since he did not describe and actual building for this sanctuary, there is no easy solution to which was described as the Pantheon. 'Hard by' stood the Fountain of Poseidon, which is easily located. But after that, Pausanias ceases to describe the rest of the terrace's temples (perhaps ignoring them due to their Romanitas), and chooses to describe statues only. Fortunately, we can deduce from epigraphic and numismatic evidence that temples G and F are to the imperial cults and Venus Victrix respectively. Meanwhile, we get the impression of a crowd of statues in the west end of the Forum standing just below the terrace, from which Pausanias picks and describes the most remarkable, an Apollo Clarius in bronze, and an Aphrodite by Hermogenes, both of which were produced before the advent of Rome in the Greek mainland. Pausanias wraps up his description of this end of the Forum with a description of twin statues to Hermes, one of which has a shrine built for it and which may correspond to the tripartite structure at the west end of the Central Shops, just southeast of Temple F.
Two temples in the area of the west forum were constructed much later than the original series, Temples H and J. Both were constructed during the time of the Emperor Commodus, likely A.D. 190 and A.D. 185 respectively. Both temples were Corinthian tetrastyle prostyle buildings, Temple J was built directly over the remains of the earlier Fountain of Poseidon. It is not known to which deities the temples were dedicated. 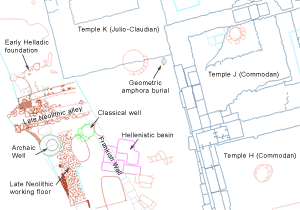 For a more detailed discussion of the West Forum Temples and Terrace go HERE. Building summary written by Eric Kondratieff and Todd Parment. Scranton, R.L. Corinth I, iii; Monuments in the Lower Agora and North of the Archaic Temple. Princeton, 1951. Scranton, R.L., "Two Temples of Commodus at Corinth," Hesperia 13 (1944) pp. Williams, C.K., "Excavation at Corinth, 1973: Forum West End," Hesperia 43 (1974) 7-13. Williams, C.K., "Corinth, 1974: Forum Southwest," Hesperia 44 (1975) 1-29. Williams, C.K., "The refounding of Roman religious attitudes," in Roman Archaeology in the Greek World. London, 1987, 26-37. Williams, C.K., "A re-evaluation of temple E and the west end of the forum of Corinth," in The Greek Renaissance in the Roman Empire. eds. Susan Walker and Averil Cameron. London, 1989, 156-162. © 2007 David Gilman Romano and the Corinth Computer Project.